(1) #METOO. Pat Cadigan opened up about her #metoo experiences in a public post on Facebook. I’ve talked about the first job I ever had after I graduated from high school. I lasted a week cold-calling people, trying to sell the photographic packages for a photography company. My supervisor was a woman struggling to be a single parent after her divorce. Her supervisor, who was onsite almost all the time literally chased me around the office, trying to get his hands on me. 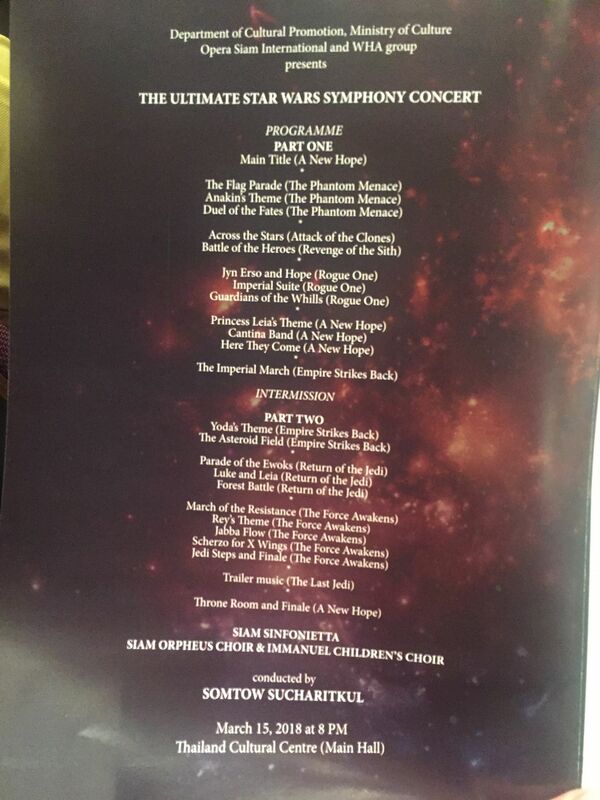 (2) THE ROOM WHERE IT HAPPENED. 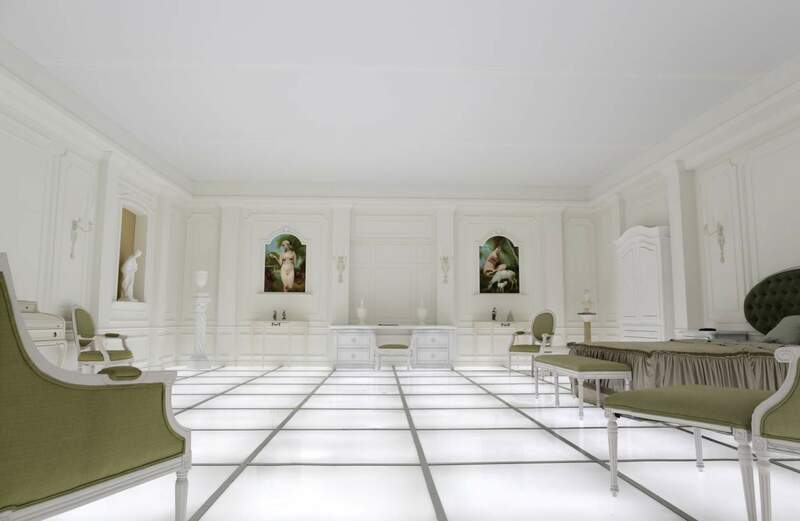 National Air and Space Museum will mark the 50th Anniversary of 2001: A Space Odyssey with an immersive art exhibit celebrating the film’s impact on culture and technology. National Air and Space Society members will get a special sneak peak of the exhibition on April 5. There is no charge for this members-only event, but advance reservations are required. (3) SIAM SOUVENIRS. 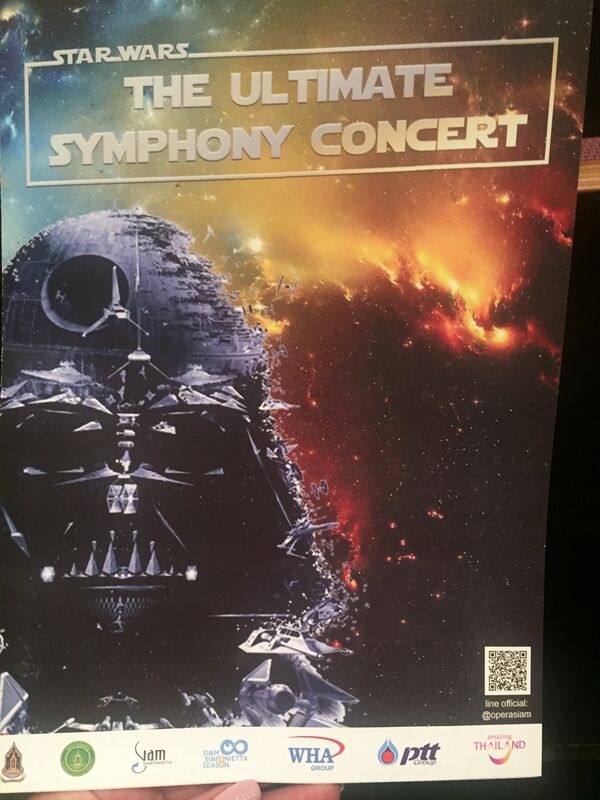 A Filer’s relative actually attended the Siam Sinfonetta concert! (4) STEM, STEP BY STEP. BBC reports a study: “Children drawing more women in science”, from 1% in 1960’s and 70’s to 28% today. Children in the US are drawing more women scientists than in previous decades, according to a new study. The “Draw A Scientist” test has been administered by sociologists in various studies since the 1960s. Researchers at Northwestern University, US, analysed five decades of the test. When asked to draw a scientist, less than one per cent of children in the 1960s and 1970s drew a woman. This rose to 28% between the 1980s and present day. However, children are still far more likely to draw a traditionally male figure when asked to depict a scientist. …Yet, the study highlights, by 2013 women were 49% of biological scientists, 35% of chemists, and 11% of physicists and astronomers in the United States. (5) IN THE MIX. Camestros Felapton gives us a “Review: Black Lightning”. I’m up to episode 8 of a 13 episode season and I think I can pull apart what I like and don’t like about it. (6) SENSITIVITY. The Washington Post’s Everdeen Mason looks at how Keira Drake changed her forthcoming Harlequin Teen novel The Continent in response to sensitivity readers, which included changing the name of one clan from “Topi” to “Xoe” to remove any comparisons to the Hopi, making another clan less Asian-looking, and eliminating “savage,” “primitive,” and “native” from the text. The article includes many examples contrasting the original and revised text. Drake and Wilson maintain that the book was never supposed to be about race. “The main theme of ‘The Continent’ is how privilege allows us to turn a blind eye to the suffering of others,” Drake said in a phone interview in February. The Washington Post compared the old advance copy with a newly revised copy received in 2018 and spoke with Drake about changes she made. (7) BLOCK AROUND THE CLOCK. The Paris Review quotes Ray Bradbury: “On Writer’s Block: Advice from Twelve Writers”. It was a little unusual that when he threw a party in 2009, not a single guest attended. …By publishing the party invitation in his mini-series Into the Universe With Stephen Hawking, Hawking hoped to lure futuristic time travelers. You are cordially invited to a reception for Time Travellers, the invitation read, along with the the date, time, and coordinates for the event. The theory, Hawking explained, was that only someone from the future would be able to attend. I am Earl’s sister, Dot Cooley. 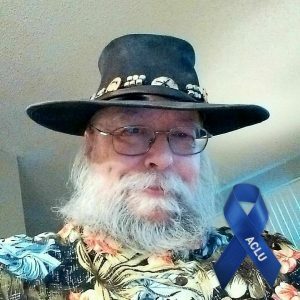 Earl left this world early this morning. He moved back to the San Antonio area 3 years ago when his health started getting worse and because of that Earl got to spend so much more time with me and our brother, Paul. Mom recently discovered Skype, so she got to visit with him more. We would love for you to share any thoughts or stories with us. Rock on ArmadilloCon! John King Tarpinian encountered a Biblical joke in Shoe. (11) MARVEL AT MOPOP. The Museum of Pop Culture in Seattle unveiled the official poster artwork for its upcoming exhibition Marvel: Universe of Super Heroes. 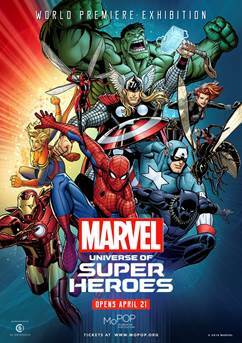 Designed by Marvel artist Nick Bradshaw, the illustration depicts some of the most iconic characters created during Marvel’s nearly 80 year history including Spider-Man, Thor, Black Panther, Ms. Marvel, Hulk, Iron Man, Black Widow, Captain America, and others. Marvel: Universe of Super Heroes is the first and most extensive exhibition celebrating the visual and cultural impact of Marvel Entertainment. The exhibition will debut at MoPOP on April 21, 2018. Tickets are on sale now at MoPOP.org. Organized by the Museum of Pop Culture, SC Exhibitions and Marvel Entertainment, Marvel: Universe of Super Heroes will feature more than 300 original artifacts, including some of Marvel’s most iconic and sought-after pages, costumes and props, many of which have never-before been seen by the public. The exhibition will tell the Marvel story through comics, film and other media, taking place as it celebrates 10 years of the Marvel Cinematic Universe, and ahead of the 80th anniversary in 2019. The exhibition will trace the story of the company and its influence on visual culture – including how it’s responded to historical events and addressed wider issues such as gender, race and mental illness – as well as uncovering the narratives of individual characters such as Captain America, Spider-Man, Black Panther and Doctor Strange. Immersive set pieces will bring the comic book world to life, and the exhibition will be accompanied by an immersive soundscape created by acclaimed composers Lorne Balfe and Hans Zimmer. (12) DO-IT-YOURSELF. Lucy A. Snyder’s satirical “Installing Linux on a Dead Badger: User’s Notes” appeared on Strange Horizons in 2004, but it’s news to me. Very funny! Reanimation puts most creatures in a foul mood, and the test badger woke up murderously angry, requiring a hasty launch of FleshGolem to get the beast under control. It is highly recommended to have the computer close at hand during the incantation. (13) VACUUMING UP THE BITS. Via today’s Boston Globe: “Data storage beyond the clouds: Wasabi promises a super-secure system in space”. “…Which sure sounds like the start of a ‘what where they thinking/yeah sure’ techno-heist thriller,” says Daniel Dern. In space, no one can steal your data. Well, that’s the theory, anyway — one that the Boston data storage company Wasabi Technologies Inc. hopes to help prove. Wasabi is partnering with a California company to create a database from outer space. The system, called SpaceBelt, will feature orbiting data centers capable of storing thousands of terabytes of information. SpaceBelt will be marketed to businesses and corporations that need instant access to their most valuable data, but who are also desperate to keep that data from being stolen or corrupted. (14) ALL STROSS CONSIDERED. Joe Sherry describes a mixed bag in “Microreview [book]: Dark State, by Charles Stross” at Nerds of a Feather. My experience of reading Charles Stross is a persistent struggle between the quality of his ideas and my perception of the quality of his writing, which is to say that I seldom find that the writing lives up to the promise of the ideas. When I wrote about Empire Games (my review), I noted “the level of Stross’s writing is actually beginning to rise to the level of his ideas” and that once Stross got the story rolling, nothing distracted from the cool ideas of the world walking between the worlds we’ve already known and the opening up of new worlds and the drama of the how the United States interacts with the world walkers from a parallel universe. Dark State picks up almost immediately after the conclusion of Empire Games, and despite the increasingly breakneck pace of the second half of that novel, Dark State suffers from some of the same issues that Empire Games did. Stross spends at least a third of Dark State resetting the playing field and planting the seeds for where the rest of the novel and trilogy will go. That’s fine, as far as narrative conventions go, but Stross is not at his best as a writer when working with a more deliberate pace. (15) CHARACTER IN CRISIS. Adrienne Martini reviews The Genius Plague by David Walton at Locus Online. In Walton’s hands, what could be a straight­forward “we must save humanity with science” thriller (not that there’s anything wrong with that), becomes, at times, a meditation on what makes us human and why that alone is a survival advan­tage. Those moments offer a chance to catch your breath before the next calamity, some of which our hero brings on himself. Walton makes Neil into a layered character, one who is frequently torn between family bonds and saving the world – and, frequently, making the situation worse because he is still working out that other people are also torn by their own layers. He’s also still learning that NSA security is never f-ing around. No one got the question, “What is Star Trek”? (17) YOU CAN GET THERE FROM HERE. 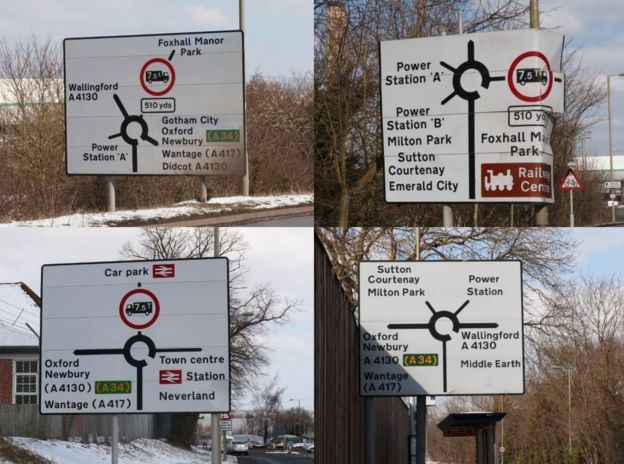 You can now get to Gotham City, the Emerald City, Neverland, Middle Earth, and other places via roundabouts on the A4130 in Didcot, Oxfordshire reports the BBC. Local resident Charlotte Westgate said she saw a hooded man in his 20s adding “Gotham City” to a sign on Friday afternoon.